The cornea acts as a clear, transparent window at the front of the eye. The cornea is the only transparent tissue in the human body with a thickness that is approximately 0.52 mm centrally and 0.65 mm peripherally and its average horizontal diameter is about 12 mm. The cornea offers 75% of the refractive power of the human eye, allowing transmission of light through it to be focused onto the retina. As well as photo-protection, by significant absorbance of UV radiation, the cornea acts as a thick, elastic physical barrier protecting the internal ocular structures from outside insults, which may be physical, chemical or microbial. Furthermore, the cornea withstands changes in intraocular pressure (IOP) and curvature changes of the eye. Transparency is obviously essential to vision. It is the cornea’s complex multilayered structure that allows it to fulfill its functions. If the cornea is affected by diseases or external insults, it loses its transparency resulting in partial or full blindness. Unlike most tissues in the body, the cornea contains no blood vessels to nourish or protect itself against infection. Instead, the cornea receives its nourishment from the tears and aqueous humor that fills the chamber behind it. The cornea must remain transparent to refract light properly, and the presence of even the tiniest blood vessels can interfere with this process. To see well, all layers of the cornea must be free of any cloudy or opaque areas. Though the cornea is clear and seemingly lacks substance, it is densely innervated with sensory nerve fibres that make it one of the most sensitive tissues of the body. 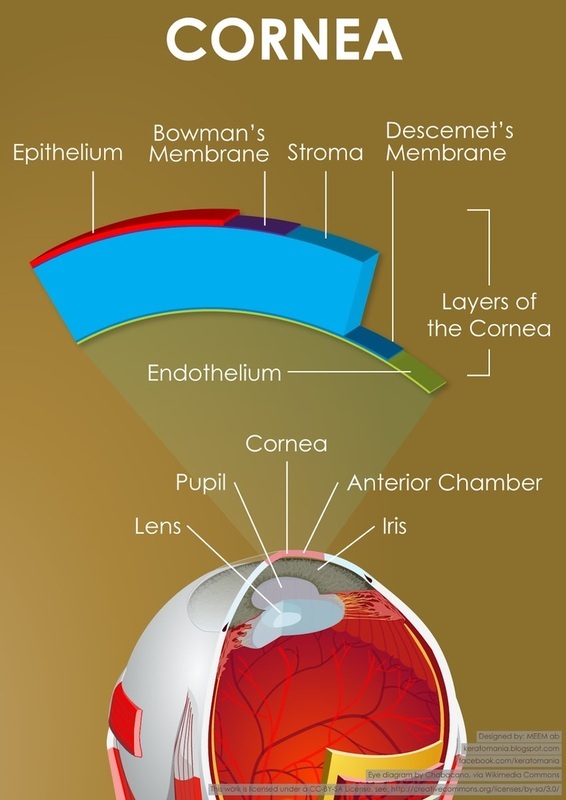 The cornea is a highly organized group of cells and proteins arranged into five differentiated layers: Epithelium, Bowman’s layer, Stroma, Descemet's Membrane, and Endothelium. 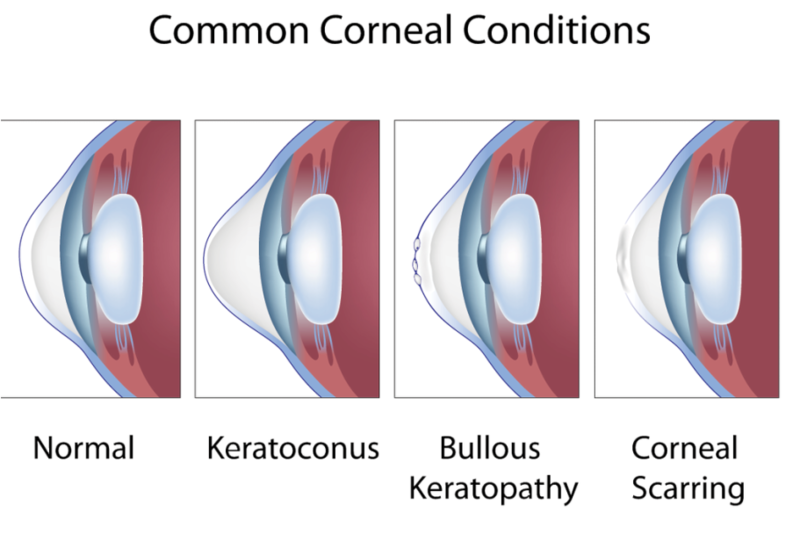 Keratoconus is a corneal disease in which the cornea bulges out and becomes thin. As the cornea becomes more irregular in shape, it causes progressive nearsightedness and astigmatism, creating additional problems with distorted and blurred vision. Glare, light sensitivity, and even blindness may occur. Corneal scarring from trauma and infection: if an injury or infection damages the deep layers of the cornea, it may not recover completely and scars may form reducing the vision. Bullous keratopathy is a corneal disorder in which small blister-like vesicles (bullae) are formed in the cornea due to endothelial dysfunction. The vesicles may undergo painful ruptures disrupting vision.